Home Social Media Controversy or social evolution? April 19, 2011 Social Media	Comments Off on Controversy or social evolution? As I was doing my morning routine of checking whats going on in the world and reading the interesting things going on in the world of online media, I stumbled upon a new website developed by Mideast Youth a grassroots digital network that leverages the power of new media to facilitate the struggle of the MENA people against oppression. They are all about working against repression, discrimination and persecution they want people in the region to be more tolerant and be open to listen and have dialogues about the social issues that matter whether you believe they are right or not. Like or not, this is a social issue that is going on in the MENA. So we can all decide to ignore, but that won’t make it disappear. Mideast youth is using social media to try to spread a message, and they are doing a good job at it. I was surprised at the number of networks and websites they have that address the MENA region in different languages. I figured that this story will most probably not be covered in most of the region’s outlets. 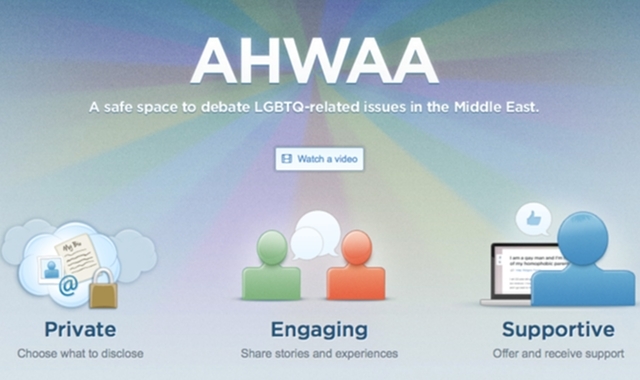 So Mideast Youth’s latest website is a network called Ahwaa and I think it is safe to say that it is the first publicly launched online platform for gay, lesbian, bisexual and transgendered people in the Middle East and MENA region. Now the site is open to all you don’t have to be gay to join, but you do have to respect others on the network. And to protect their users it is recommended to make all private. Now the website has included some game mechanics in it where users are encouraged to comment and participate in conversions as well as providing support in return for points, the more points a user collects the more secret features of the website they can unlock in the second version of the site which is planned for the future, no date has been set as of yet. The whole idea behind the points system is to produce trusted users which can be helpful to other individuals who are afraid to speak up and join the conversation. For a society that considers this to be a taboo topic I think the only way people can be comfortable talking about it is through private social networks such as this one. The social media revolution that happened (and still happening in some places) has now morphed into a social media evolution where such topics and many more are being tackled and addressed head on. You can watch a video demo of the website here. So what do you think of the Ahwaa site, do you agree with it or not? Let us know your comments and feedback below. Having worked with top digital agencies and companies in the MENA region for the past number of years I'm now looking now to venture on my own with small side projects in online, SaaS products. Things I like include: gaming, sports, technology, social media, start ups, funny things and reading about new bright ideas. © Interactive & Social Media news in the Middle East is powered by WordPress & FancyThemes.